There are dozens of great public golf courses around the Puget Sound, but Chambers Bay Golf Course in University Place is arguably the best of the bunch. 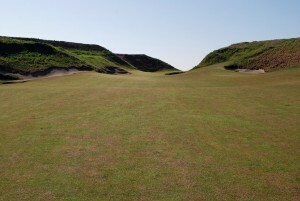 From the start, the course was designed to host a U.S. Open, and they’ll have their chance in 2015. Chambers Bay Golf Course (6320 Grandview Dr. W. in University Place) is unlike any other course I’ve played. Work started on Chambers Bay in 2005 on the site of an old sand and gravel mine (there are still ruins from the mine near the 18th tee box). It was designed by Robert Trent Jones II to play like a traditional Scottish links style golf course, and it does just that. 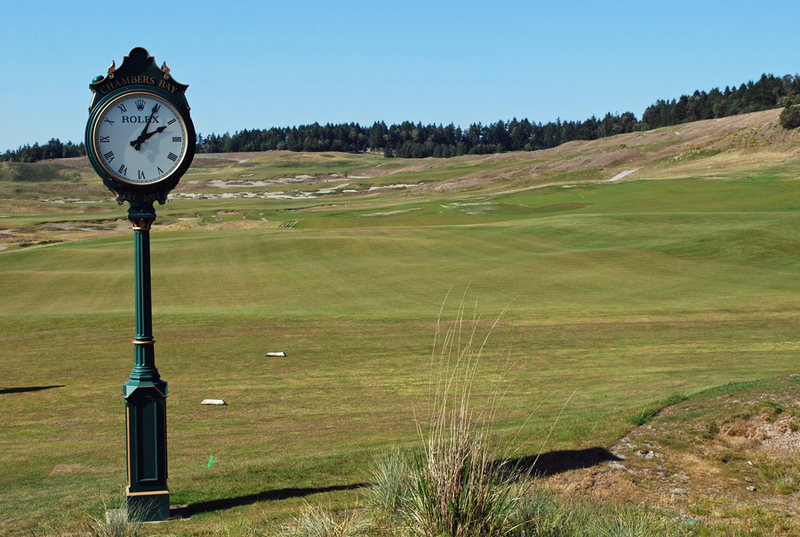 There aren’t traditional hazards at Chambers Bay Golf Course. There is one tree (that doesn’t — or at least shouldn’t — come into play) and no water, but there is danger all over the course. Chambers Bay is made difficult by the firm ground, the rolling dunes and the incredible amount of sand and waste areas. The weather also plays a role at Chambers Bay. The golf course is located right on the Puget Sound. That makes for incredible views, but it can also mean lots of wind. The rain is also an issue. I’m told Chambers Bay drains really well, but the moisture still messes with the speed of the fairways and greens. That means a long course (it plays 7,165 yards from the blue tees) is made even longer if it’s wet. NOTE: There are no golf carts allowed at Chambers Bay Golf Course (unless you have a health issue). Your round includes a push cart, which makes life easier, but you have to walk the entire way. It wasn’t hard for me since I’m a fairly healthy dude, but I’m sure it can be a little draining if you’re not ready for it. Remember — it’s a long golf course. I had perfect weather when I played out there, so I had to battle the course the way it was meant to be played — firm and fast. I talked to a caddie before the round and he told me to take 10 to 15 yards off most of my shots, because the ball would bounce or roll the extra distance you cut back. The greens, which are just as hilly as the fairways, are really tough to read because of the speed. I highly recommend spending extra time on the practice green before your round to get a feel for what you’re working with. 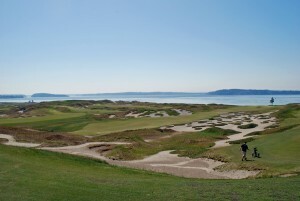 There are several other features that make Chambers Bay Golf Course unique. There is a public walking trail that meanders three-miles through the golf course. I’m not kidding. There are people jogging, walking and talking on the path while you’re playing your round. The grass (which everyone calls fescue there) is tough and it dries out quickly (again, the irrigation is key to the success of Chambers Bay). That means the course turns really brown in the spring and summer months. While it might be ugly, that’s the way it’s supposed to be. You can’t talk about Chambers Bay without mentioning the rates (which are fluctuating right now because of the U.S. Open). It’s not cheap to play out there. Greens fees for non-Washington residents are between $275-$299, while Washington residents can play for $215-$249. Pierce County residents get an even greater discount. 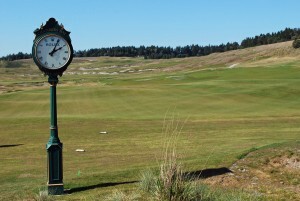 They can play Chambers Bay Golf Course for as little as $169 in the summer months. Click here for a full list of rates or book a tee time. I didn’t play well at Chambers Bay Golf Course, but I still had an incredible time. The course is challenging (I’ve never hit so many sand shots in my life) and the views are great. I got to play Chambers Bay for free, so it’s hard for me to say a round there (or anywhere) is worth $150+. But, if you can afford it, I highly recommend giving Chambers Bay a shot. 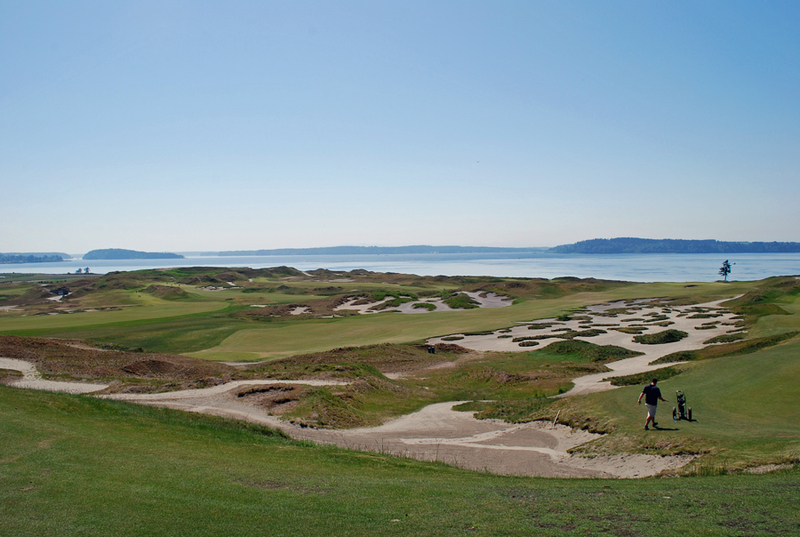 Have you ever played at Chambers Bay Golf Course? What did you think? We’d love to hear about your experience! Please leave a comment below or connect with us on Twitter, Facebook and Google+. Don’t forget to also check out Seattle Bloggers for more fun things to do around the sound!